A global initiative is underway to expand and harness the power of yoga in the West Bank and Gaza. Rama Vernon, one of America’s yoga pioneers, the Give Back Yoga Foundation, 7 Centers Yoga Arts, and the Farashe Yoga Center, located in Ramallah, have all collaborated to support Palestinians’ exploration and use of yoga in everyday life. 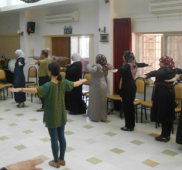 Lead teachers from these organizations traveled with Rama Vernon to Palestine May 23 to June 7, 2015, and work in partnership with Farashe Yoga Center to train up to twenty teachers. Following the training, new teachers introduced yoga to area residents through work in urban refugee camps, schools, hospitals, and other venues. Yoga is largely unknown among Palestinians. Over the past five years, however, more Palestinians, women in particular, have embraced the discipline as a way of coping with their daily stresses of the Israeli occupation, including commuting through military checkpoints, unstable employment, and political unrest.